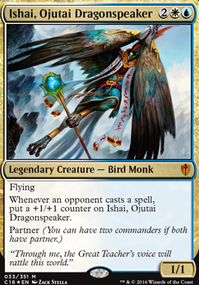 Some cards that I run in a similar deck that I run are Warden of Evos Isle , Thunderclap Wyvern , Squadron Hawk , Arctic Aven . TheRoaringRegisaur, thank you for your suggestions! I want to replace the Take Vengeances with Seal Aways, but Seal Away is fairly expensive money-wise (I relied on draft chaff for the two I included). I might look through my collection and see if I can do that. 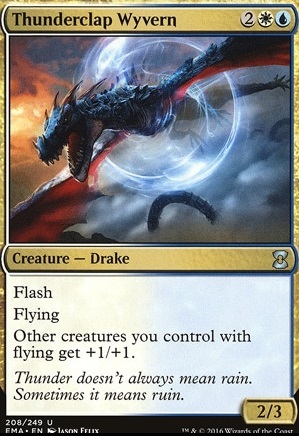 Cutting Raff Capashen, Ship's Mage for Thunderclap Wyvern seems like a good idea. I'll probably do that, especially since I don't even have any historic spells for Raff. That said, I'd go up to three copies of Thunderclap Wyvern. What third card should I cut? Ethereal Armor is a neat include, but I'm still thinking about how it fits together with the deck I'm building. Hey there! I've made some of the recommended changes you suggested, and I will say without a doubt, Thunderclap Wyvern is bomb in the flier build. Really helps up the size of everything. So thanks for that. 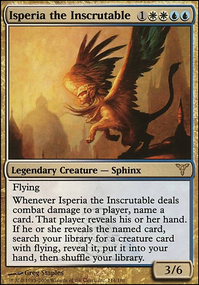 What are your thoughts on the new Resplendent Angel, and to a lesser extent Demon of Catastrophes? My thought was the demon MIGHT be good if I'm running Lingering Souls, and could basically swap out a soul or a Mausoleum wanderer or what have you for a big body late game. The angel just seems like a great card. Thanks for the feedback. I appreciate it. You have a really good point about queller and thunder both having flash. That adds a nice bit of flexibility (for me) and unpredictability (from the opponents pont of view). When amassing cards for this brew I did pick up Smuggler's Copters so that will be an easy try out. I was hesitant to play with it because I feared lots of artifact hate in a sanctioned modern event. I also really like your use of Moorland Haunt. I'll probably grab those when I order Thunderclap Wyverns. Thanks again for the advice flying buddy! maxon First off, the consistency issue is probably because you aren't playing Smuggler's Copter. This card can dig you out of bad hands and find you your Favorable Winds, more creatures, or your sideboard answers in games 2 and 3. I've been playing Thunderclap Wyvern for a while now and it actually has won me the game about every time I've cast it. It is really synergistic with Spell Queller, as you can hold up the mana to be able to cast either, and then cast whichever one seems best depending on what your opponent does. I think your choice of running Lingering Souls is interesting. I was running 4 of them instead of Squadron Hawk which is the flex slot in this deck. 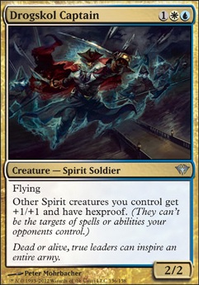 Lingering Souls might actually be better than the hawks, but I personally didn't have as much fun with it. I also tried Mantis Rider when adding red, but adding a 3rd color makes it so Moorland Haunt is awkward to include as it's hard to play 3 colors with colorless lands in the deck. Moorland Haunt is one of my favorite cards in the deck so I'd never want to have a build where I'm playing less than 2. It's super important to the deck's strategy. It's kind of an instant speed Lingering Souls on a land. It has won me countless grindy games. It also just digs you of a bad situation after a Wrath of God type effect. oooo NICE! I have a similar list (Swing X In The Air). I haven't actually taken it to an FNM though. Just played against friends' modern decks casually. I find mine isn't super consistent. I'm particularly interested in how you feel Thunderclap Wyvern has played for you. I know you said you're thinking about it already, but I do think you should put Cyclonic Rift in here. In the right circumstances, it can be a win-con. Rhystic Study should be in pretty much every blue deck. Swan Song for the flavor?? Thunderclap Wyvern pumps your birds more. Pride of the Clouds could be cool in this deck.